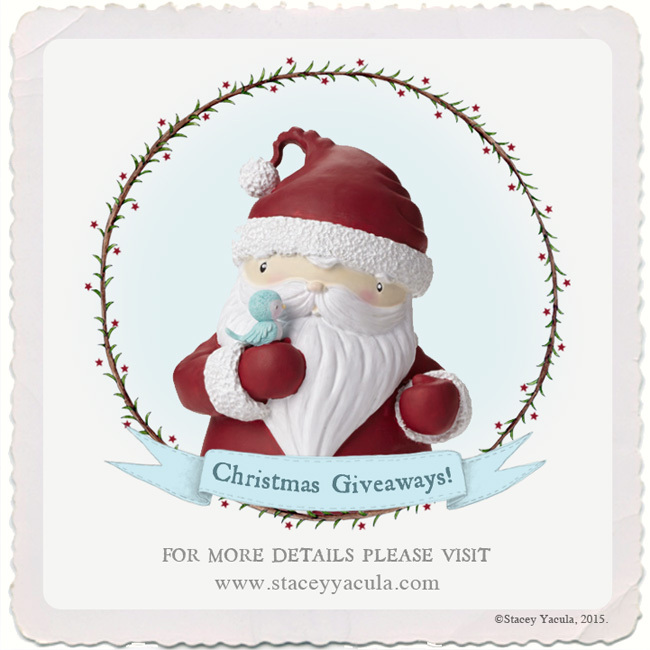 stacey yacula studio: Christmas Giveaways! yes, i said giveaways... plural! that i created with Enesco. so, i created 3 giveaway packages. snowman plate and cardinal plate. here is how you may enter to win! 1) comment right here on my website. please share this giveaway with others. based on the order of the draw. Saturday December 5th, 2015 at 6pm EST. What an awesome giveaway! My choice is number 3, just LOVE those adorable little birds! Merry Christmas to you from Finland! Ahh I love them all but if I had to choose I would choose 1, I love penguins! Oh Stacey, they're all beautiful!! Thanks for the chance!! Adorable giveaway with beautiful gifts.. OMG.. Choose?? Difficult! Everything is just georgeus! Packages No 3 is for me! Thanks you so much! Good Morning! I love your adorable little Characters. If I were to win, I would like #3. Serving Santa using this set would be perfect! Thank You for this opportunity! I love your designs! When I see them I immediately wander if you will create a similar designed stamp that I will get to enjoy colouring. I simply adore your art, and find it impossible to choose which giveaway set I love more. Thank you for the chance to win such a wonderful gift! The best give away of all! Thank you for your generosity! Have a wonderful holiday and vacation! If I have to choose then I would pick number 1. But, honestly I love them all! Thanks for the chance to win. Thank you for the opportunity to win your beautiful art work! Number 3 is it forme as it includes my favorite things: Santa and birds. I adore all your creations. This is so generous of you I would love any single one but if I had to choose it would be number three as that plate I'd gorgeous. Thank you for the giveaway!! I love your designs -- I think I have every single one of your stamps via Purple Onion Designs. I would be happy with any of the sets, but #2 is my favorite -- who wouldn't love drinking cocoa on a cold winter evening out of those snowman mugs?? I'll be keeping my fingers crossed! 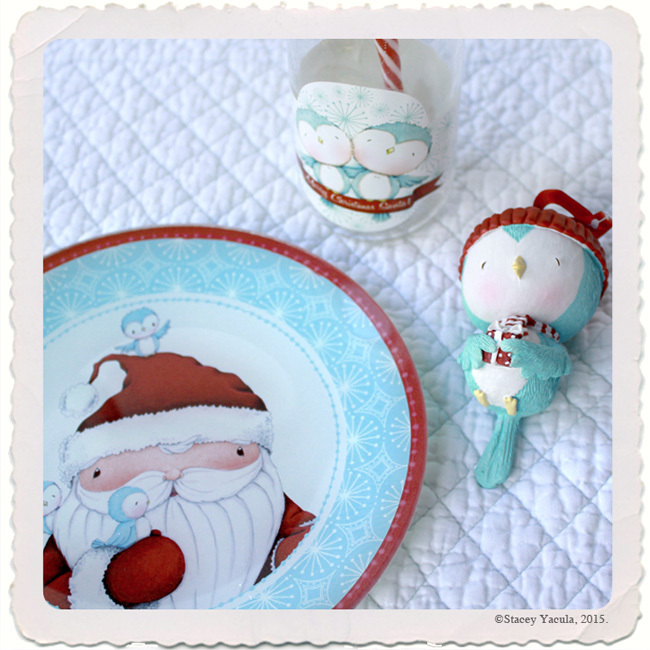 Thank you so much for the giveaway :-) I love your images and those mugs, plates & figurines are very cute! I know your work through the Purple Onion stamps - Cedar is one of my favorites, but I love them all! Oh these are so amazing! Ahhh! How to pick one! I love number three as I know some id like to share it with! Thanks for the chance! Well, Stacey, these are all totally AMAZING! How generous of you to have a giveaway! Too hard to pick a favorite, I love them all...but I guess I'd have to say No. 3 (I adore that bluebird)! I'm off to share the news on Facebook! Your images are just amazing and seeing them translated into figurines and plates is wonderful! It's hard to pick, but I love #1. Thanks for a chance to win and happy holidays! I just ordered and received 3 of your ornaments for each of my daughters!! I think they are amazing and am sure that giveaway #2 would be just "right" for me!!! ;) Keep up the good work!! Your stuff is amazing!!!!!! Oooh such a sweet giveaway!!! I will borrow your picture & place on my blog sidebar. Wow so generous of you...these creations are all so cute but I would love to win the second giveaway with the mugs~ Thank you and wishing you and yours a very beautiful Christmas season. These are adorable and I love all your designs! I'd have to say number 1 was my favorite but the others were very close as well! Stacey, thank you. I love your design, it s amazing, you know?) My choice number 1, but i like all! 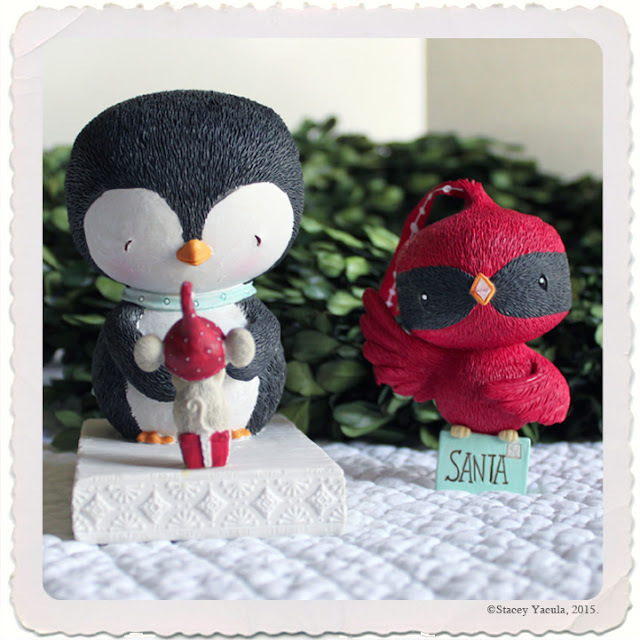 I am in love with your delightful snowmen so I have to pick #2! 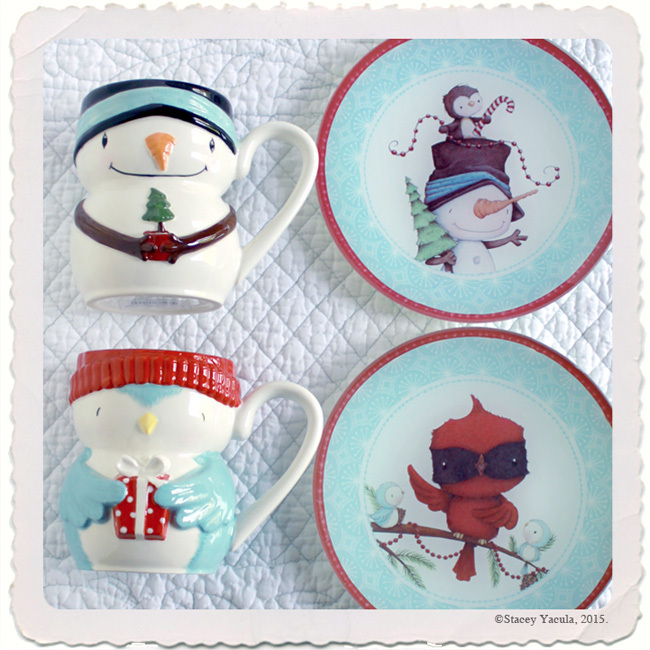 Adorable mugs and plates and that snowman is my favorite! Love all your awesome designs and have quite a few of the POD stamps! Thank you for the chance to win one of these packages. I love all of them, so if I'm a lucky winner, I wouldn't be picky on which one I'd like. They all are great. I just love your work and bought some of your fabric up in Lancaster County, PA over the weekend. I love all you do. If I'm one of the winners my grandchildren would be delighted with #3. Thank you for your generous give-a-way. Thank you. My preference is #1. I love all of your work!! If I had to choose, I'd pick number 1!! Thank you for sharing your art with us all. What a wonderful giveaway...I would love any of them, but #1 seems to make me smile the most...always love your figurines and these would be perfect with our holiday decorating! Hi, thanks for the chance to win. I love them all but #1 would be my first choice. I have one of your Enesco snowmen with the penguin and mouse on his hat on my desk right now, and have my one of kind snowman made by you there as well. Your Enesco designs are hard to find, but I love them. I hope you have the best holiday season, and I look forward to more creations in the new year. #1 but I love them all and everything you design. Over here in Holland, it's very difficult to get your Enesco line. Thank you for the chance to win. I've been a fan of your work. I would be happy to win any lot. But I love the dish. Plath lot №3 and №4. Also, please tell me where can I buy it? Through the Internet. I live in Russia. That's what I'm feeling lucky, small chance. But I would like to have something out of it. I would have bought. Love them all but if I have to choose I will pick #1, Happy holidays Stacy love your designs! I love your sweet little images. While any of the gifts would be wonderful, I would like gift #2. I have my fingers crossed to win #3!!! Thanks for an opportunity to win!! Shared on FB. AOL are super-cute! It is hard to narrow down, maybe 3rd one could be my favorite.... Hard to choose! Thanks for the chance to win an awesome gift! Thank you for the chance to win. My favourite giveaway is number 2 but I love them all. Stacey I love all of your work. Thanks for this offer. If I win I would like #3. Thanks again. Omg...these are all so adorable! I wouldn't even be able to pick one that is my favorite. I think I'm too late for the drawing but just wanted to tell you how cute these are!